Most people who want to capture their Miis on their computer just take a digital camera and point it at their TV, hoping for the best. You don’t have to recreate your Mii to use this process, but it comes out looking pixely, dingy, and grey. TVs don’t photograph well. A few others go a slightly smarter route and take a screenshot of a Mii editor site. This allows for a cleaner, 100% digital process, but it forces you to re-create your Mii a second time by hand. You might not get it quite right if you’re not careful, and if the online editor you use isn’t very good, it’ll introduce further errors and you won’t get the look you’re expecting. Fire up Mii Transfer and pair that remote to your Mac using the on-screen instructions. If it fails, just try it again. Mii Transfer only came out 8 days ago, so it’s not perfect yet, but I’ve had great success with it. For each Mii you want to capture, go to the full-screen Mii editor and click “File” and then “Load”. Select your “.mii” file and click OK. Your Mii will appear on the page. Right-click (or control-click) the Mii Editor and select “Zoom In.” Repeat this until the Mii head fills your screen without being chopped off at the edges. (For me, this was only one zoom.) If you go too far, just zoom out. People with larger monitors will get better results. Take a screenshot! I prefer to use Command-Shift-4 and hold down Control to capture the Mii to my clipboard, but whatever works for you is fine. Bring your Mii into Photoshop or your image editor of choice, use the Magic Wand or equivalent tool to remove the background from the image, and crop the image so it only contains your Mii head. There you go! 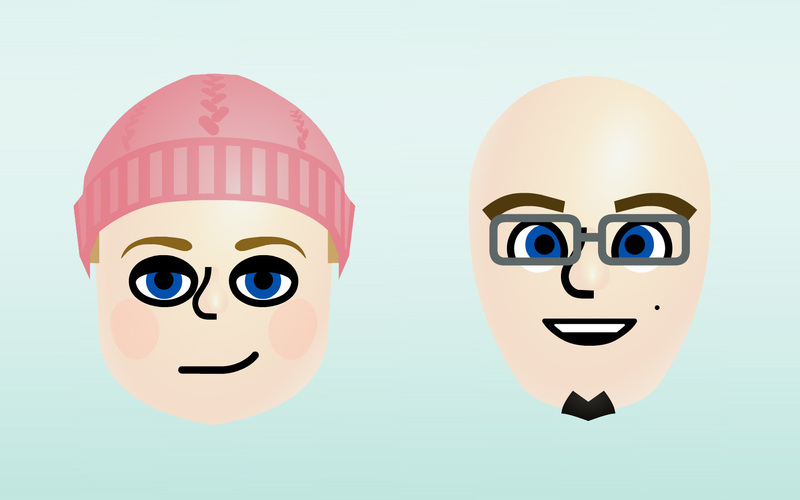 A nice, gigantic Mii head that can be edited, played with, resized, dropped onto any background, or even dropped into family photos for a surreal kick. Try ’em on your next Christmas Card! Dang… I’m going to do that. Enjoy, and don’t forget to digg it.